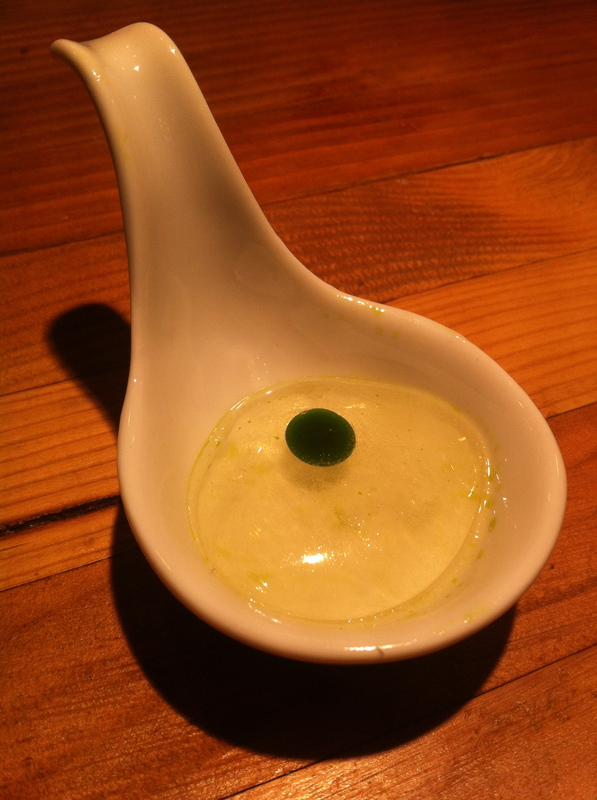 It’s been a long time since I’ve tried my hand at spherification, and I thought it was time to revisit the technique. I’ve done it three times before: the first meeting of Jet City Gastrophysics, my cooking session with Chef Ian Kleinman, and another time when I made some coffee caviar. One of the iconic photos from Modernist Cuisine is their Tomato Basil Spheres, so that seemed like a perfect place to give it another go around. It’s basically an Insalata Caprese that’s been liquified. Welcome to the future. A couple of months back, I had a happy sequence of events. First, I got a raise. Always a cause for celebration. Then, the Modernist Cuisine cookbook publishing date was moved from December 15th to March 15th. Not exactly happy news, but I did set aside $500 to buy it (it has since been reduced to $451.25) that I now had freed up. And soon after that, I found a centrifuge. When I had a chance to speak with Chef Maxime Bilet about cooking my way through his upcoming book, he said if I really wanted to do it, I needed to get a centrifuge. I was totally expecting him to say an immersion circulator. Perhaps it was obvious that I should already have one. But OK then. I began surfing the Internet to see what I could find (the centrifuge posts at Cooking Issues were of great help in focusing in on what I should look for). Most used centrifuges that have the volume I needed (as opposed to desktop centrifuges that only spin small test tubes) cost around $1000 – $2000 plus freight shipping on top of that. Way too much to justify. But I kept looking and stumbled upon a used laboratory equipment company in Seattle that was going out of business. They had centrifuges in excellent condition going for cheap. I went to the warehouse to check them out and drove away with a frickin’ centrifuge in the back of my car. A refrigerated unit at that. For $500! 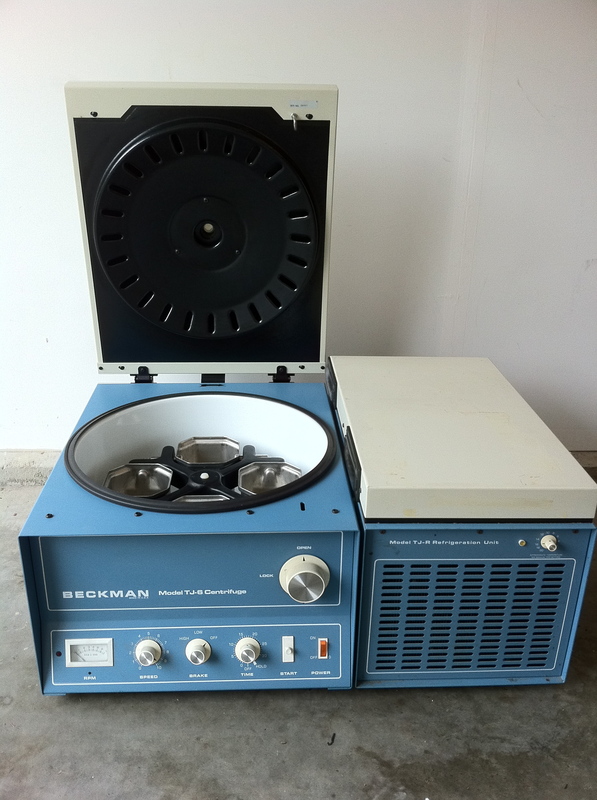 The centrifuge I found was a Beckman TJ-6 with a TJ-R refrigeration unit. It has four buckets that hold up to 2 liters (about 8.4 cups). It gets up to 2700 rpm, or 1520 g’s. It is a large metal beast with a cool 60’s style simplicity. They really don’t make things like they used to. The Cooking Issues guy’s tabletop centrifuge pulls about 4000 g’s. Chef Bilet didn’t think it would be an issue to separate things, but only that I would have to spin longer. Well, only one way to find out. Now, I should step back for a moment and answer the question: why do I need a centrifuge in the first place? A centrifuge’s principle purpose is to separate substances based on density. Heavier substances, called the pellet, collect at the bottom, while lighter substances, or supernate, collect at the top. Culinary purposes include extracting oils from nuts and separating cream from milk. To use my new beast, however, I needed to find suitable containers for the food to be spun in. The guys over at Cooking Issues settled on sealed vacuum bags. 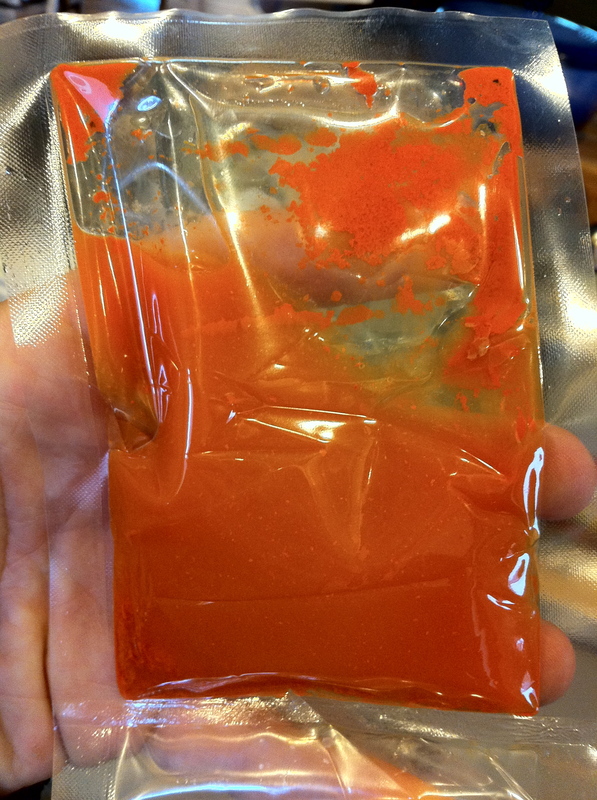 I tried the bags I had on hand using some carrot juice, but they were too small so the pellet and supernate wouldn’t separate fully. I searched my local supermarkets and found some small Ziploc containers that fit into the buckets nicely. The lids were just a bit too wide, but the body was good enough. I filled them up and spun them. Turns out it was not good enough. I immediately heard a crack inside the machine. Centrifuges can be very dangerous with objects spinning at such high speeds. It is said what you pay for in a centrifuge is the housing in case of an accident. And accidents do happen. I immediately turned it off and left the room. After a couple of minutes, I came back in and checked to see what had happened. The problem was the centrifuge worked perfectly: as it created over 1500 g’s, the sides of the lids were crushed and the containers snugly fit themselves into the bottom of the buckets. I kept searching and found some plastic containers at Storables that fit in the buckets and didn’t crush when spun. Finally I could start seeing what this ‘fuge could do. 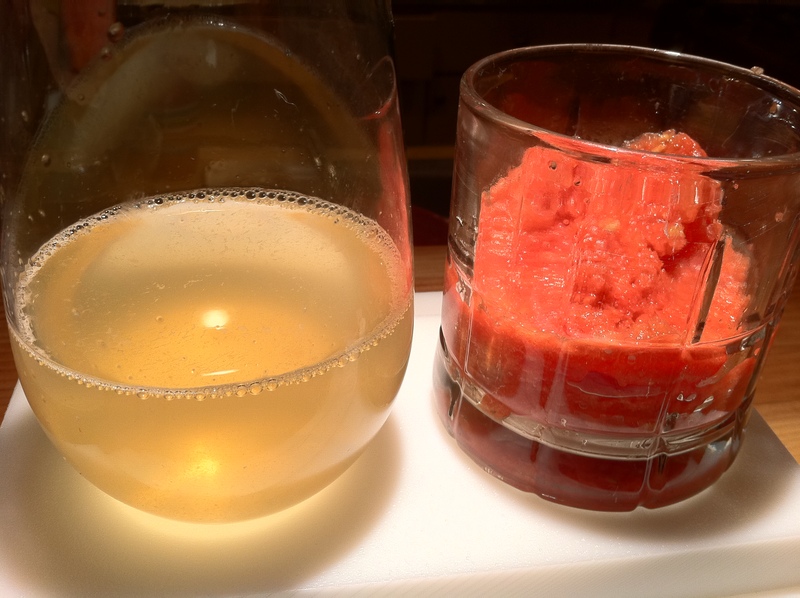 One use of a centrifuge: ‘instant’ tomato water. Usually you let a puree of tomatoes sit in a cheesecloth over a bowl for 8 to 24 hours. 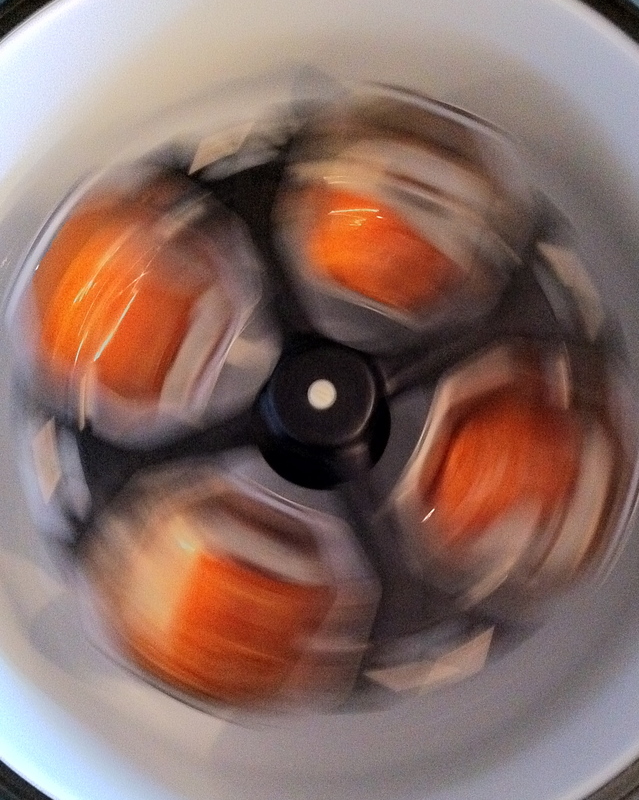 With a centrifuge: 30 minutes or less. You also end up with a nice tomato paste to use however you wish. I made a caprese martini: an instant liquor infusion of basil and vodka with spun tomato water in a chilled martini glass lined with olive oil and salt. Deliciously awesome. So good my best friend put it on the menu at his bar. New Cookery finds its way to the masses! I also took the sous vide apple puree I made and spun it. 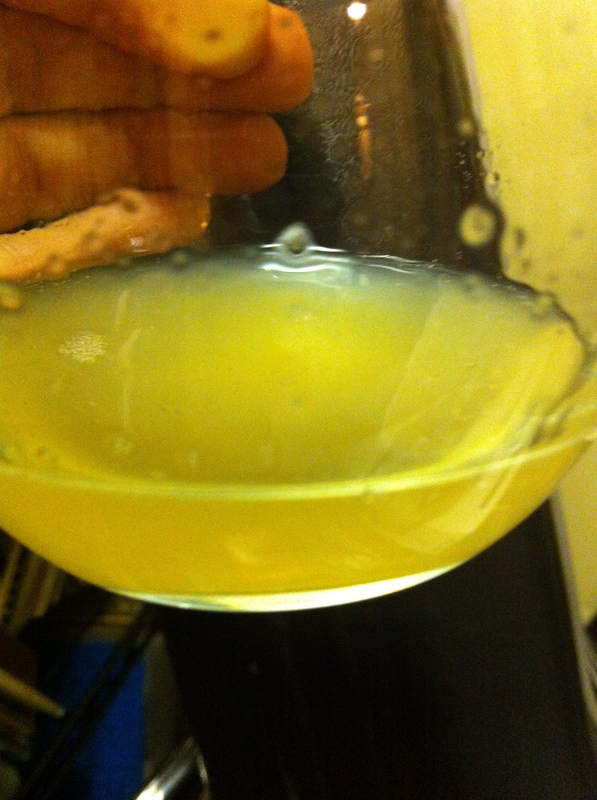 The result: a thick sweet apple syrup. The ‘pellet’ of apple puree left was incredibly thick and just as good as before. I’ve also taken fresh carrot juice and ‘fuged it. 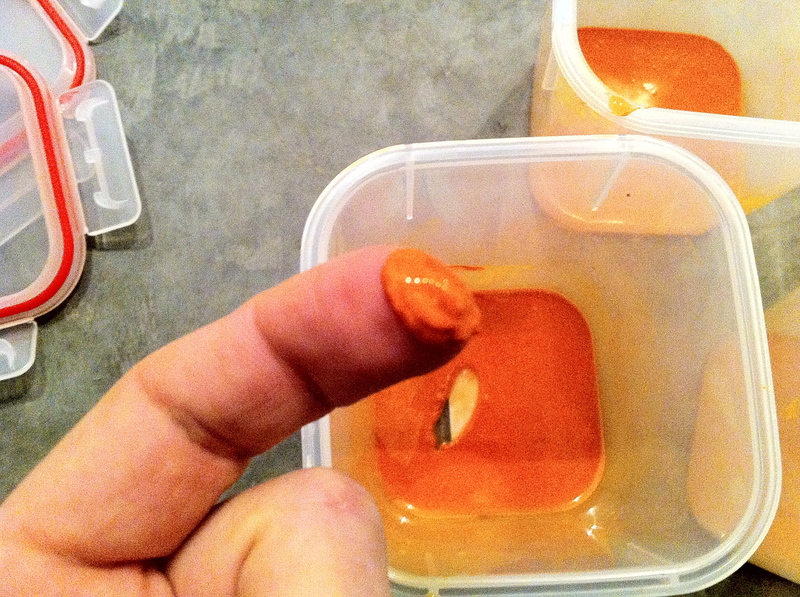 I was left with a thin carrot paste at the bottom of the containers. I didn’t know exactly what to do, if anything, with it. I remembered watching Katsuya Fukushima and Ruben Garcia from Minibar on Iron Chef and they said something interesting on their approach to cooking: “The fish talk to us and say, we want to be cooked that way.” So I looked at this paste and said “what does this look like”? And it looked like paint. I guess it wanted me to paint with it. So, I did. 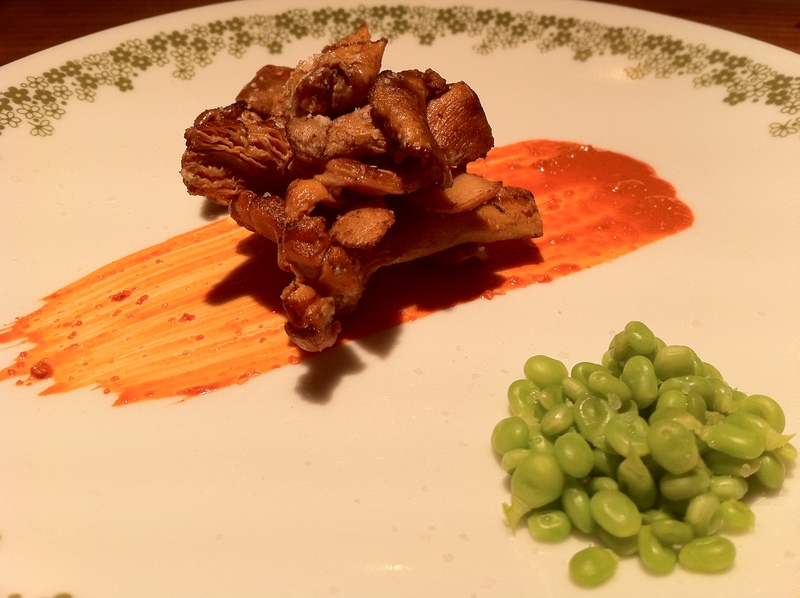 A Little Snack: Chanterelle Mushrooms with Sugar Snap Pea Ovules and Carrot...Streak? A streak of carrot paste, topped with hand foraged chanterelle mushrooms and the seeds (or ovules) from sugar snap peas. It was great. But I also realized I have fallen off the deep end. I mean, I centrifuged carrot juice and took sugar snap peas and de-seeded them by hand just for a small meal alone at my house. I’m done for. I’ve lost the plot. I’ve been spun crazy.